My nighttime routine typically just consists of cleansers and serums, with the occasional mask and spot treatment if I have a particularly stubborn spot that I want gone immediately. I try to get as much makeup, dirt, and grime off of my face as possible so I'm not sleeping on skin that's still dirty and coated in layers of other products. The last thing I need to deal with is my skin detecting something on my face that's not supposed to be there, freaking out, then proceeding to grow another face on my face in the form of a zit. Recently, I picked up two skincare bits at Target and have been using them religiously every day (sometimes twice a day). My skincare routine severely lacked both of these products. My previous toner wasn't the typical kind of toner I was used to, it was a sort of gel to liquid toner, not a purely liquid toner where you can see what's being pulled from your skin onto the cotton pad. Since I had a giftcard and the will to shop that day, I popped two products I've been dying to try for ages into my basket and have been putting them to the test for about two weeks! 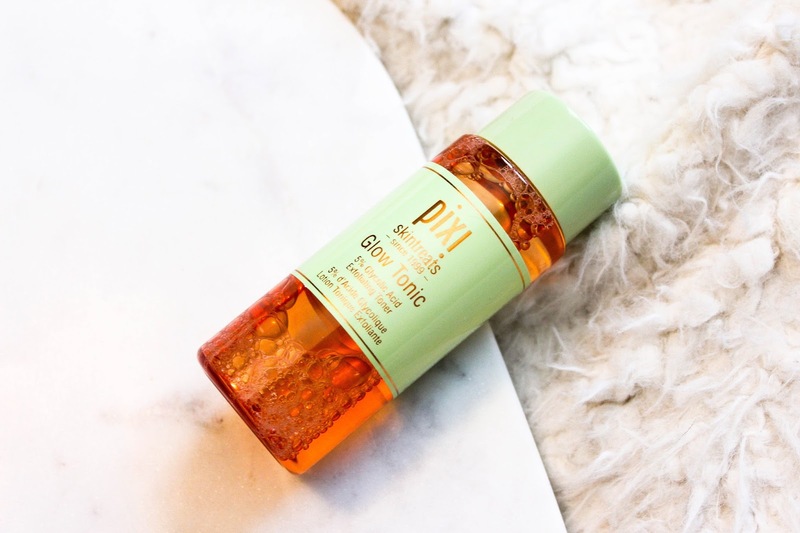 The Pixi Glow Tonic is a liquid exfoliator with 5% Glycolic Acid that gently exfoliates your skin so it is healthy and glowing. There's also Aloe Vera in it to keep your skin soothed, meaning you won't have irritated skin from the acids or from, you know, exfoliating dead skin off of your face chemically. You can use this day or night, but I just use this every night after I cleanse my skin, but before my toner. My skin is pretty solid when it comes to "harsher" products like this, but if you feel your skin getting burned or irritated by something like this, switch to using it every other day and if it still is stinging, then perhaps it's just not the right product for your skin (though this one is recommended for dry, mature, sensitive, oily, normal, and combo skin, but that doesn't necessarily mean it has to work for you). Also, even if you should totally be wearing SPF anyways, make sure you're wearing it after you use this product (especially in the morning) because it makes your skin sensitive to light and the last thing you want to do is expose your newly exfoliated skin to the harsh sun rays. If you want a really great review of this product and its breakdown, this Cosmetopia article is super informative and I'm not even going to pretend I know more than what would be said here. Since I've only been using it for two weeks, I have nothing huge to report on, but I am still going to keep using this because if it does what it's supposed to, my skin could seriously benefit from what it treats. This product can help reduce dark marks (aka all of my age-old acne scars), soften dry or flaky skin, prevent acne to some degree, and so much more. I haven't noticed a huge amount of change, but I haven't gotten any breakouts or rashes because of it like I've heard about similar products that I will not name. Have my spots completely faded? Absolutely not, but it's only been two weeks and it's supposed to take around two months or even longer. I shall keep using it and keep you guys posted on whether or not it works well long term. Over the years, I've heard this recommended as a toner so many times that I'm shocked that it's taken me until now to actually go out and buy it. 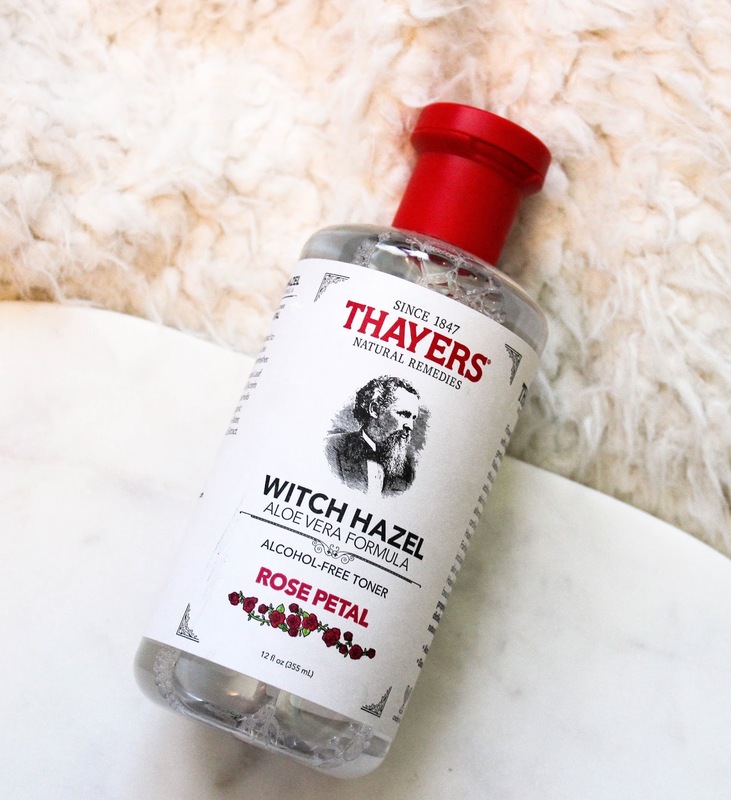 Witch Hazel is natural and moisturizing. This toner is alcohol-free so it will cleanse your skin without sucking every last bit of moisture out. It's ideal for sensitive skin, but my skin isn't necessarily sensitive and this still works well with my skin, especially when it comes to not making it tight and dried out. I use this every morning but also use it at night after I use my Pixi Glow Tonic for some extra toning action. I don't have too much more to say about this because, again, it's only been about two weeks since I started using this and it's not meant to do everything that, say, Pixi Glow Tonic does. But, since it is full of Vitamin C, it can help with collagen production, strengthening skin cells, and my favorite, fading blemishes and scars. 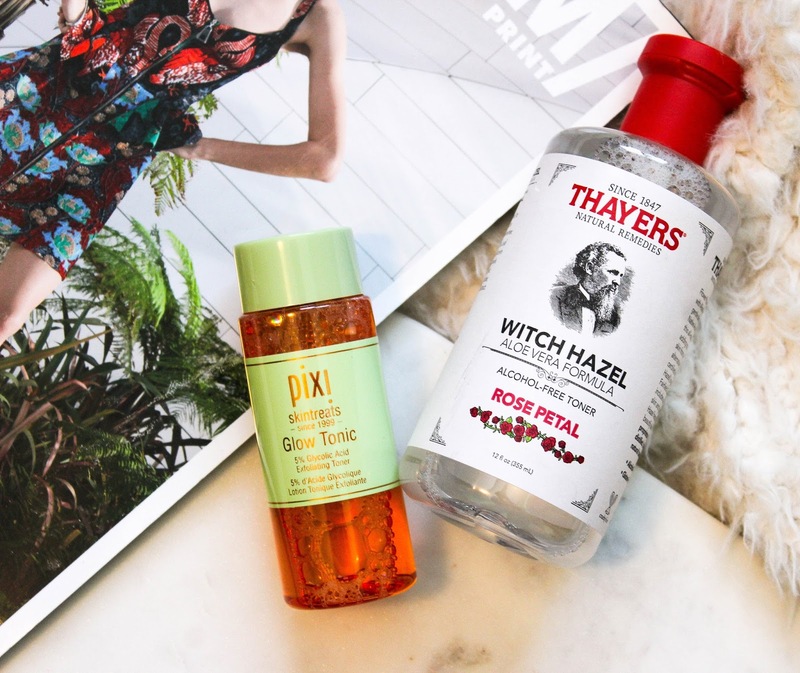 My Thayers toner does a fantastic job at grabbing the remaining makeup and dirt from my face (it's incredible how much still remains even after cleansing) so that my skin is fresh and clean before my serums and bed. Really crossing my fingers that the combination of these two products tackles my last struggle with my skin that isn't just hormonal breakouts from my period and, sometimes, stress: my pigmentation and scarring. What's your favorite drugstore skincare product?